Then if your visitors use a browser that implements CSP properly, malicious scripts or images (trackers) will be refused to load. CSP can also be used to protect content against unwanted embedding from www.my-forum.com (X-Frame-Options): third party websites will not be able to include scripts or to embed the whole site in an iframe. While working on the project, first I had a naive implementation done on CSP, I observed strange (and rare) bugs. It seemed that the CSP reports – that we used for measuring the presence of web logins – sometimes didn’t arrive at all. Soon I started to wonder if I can still rely on my assumption that CSP implementations in different browsers works the same way. Therefore I made a small tool to evaluate different implementations, and found interesting differences between implementations in differend browser brands. Furthermore, I also discovered a strange bug in the Chrome browser: sometimes it forgets to deliver CSP reports. The layout scheme below summarizes how this tool works. Scheme of the CSP testing tool. But how CSP reporting is implemented in different browsers? A notification is pushed to the browser console to notify the user. The CSP violation report is sent to the report-uri. To the contrary, I found that these events are not encapsulated in an atomic event, significant delays can occur in between them. In our experiment, the timing is important, because we are measuring if a given CSP violation occurs in time or not. However, if it doesn’t happen, how can we know if we can move on? Well, the onerror could be such an indicator, or in the worst case, if a timeout happens. This also shows that the onerror and CSP violation events are not encapsulated in an atomic transaction, as we can observe ~1s difference! Chrome does something similar to Firefox, but very strange bugs emerged during my experientation – I’ll discuss these a later. As Opera uses the Blink layout engine from Chrome, it has the same issues. 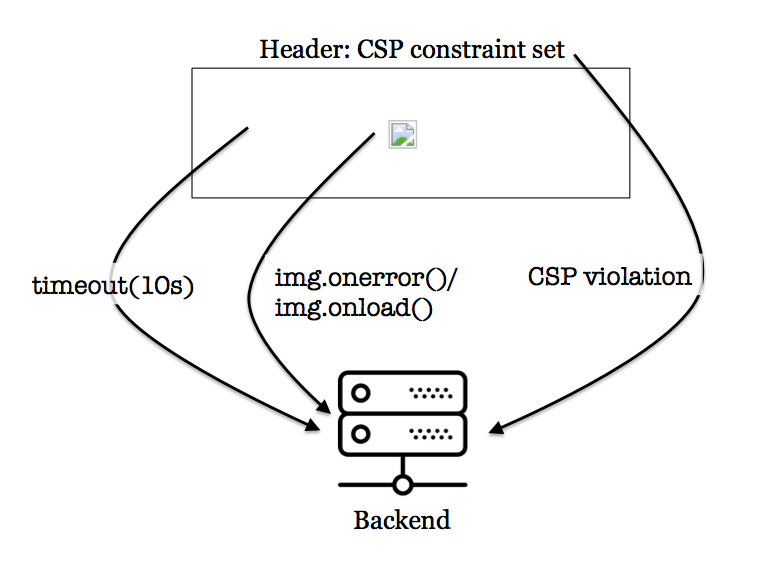 Safari doesn’t fire the onerror event if the image cannot be loaded due to a CSP constraint violation. Microsoft’s browsers make the lives of web developers easier: CSP is neither supported by IE, nor Edge, as far as I know. In Chrome, I observed strange inconsistent behavior regarding how the violation event is fired. This appeared in multiple flavors, but rarely, making systematic reproduction difficult. Probably the most serious bug in Chrome I encountered was when the browser just stopped sending violation reports. As I tend to avoid restarting my laptop for 1-2 weeks, usually I observed such phenomena after a longer period of time with varying delays. To get the Chrome browser working again, I had to restart it. Sometimes I also restarted the system, thus I can’t surely state that the browser restart was always enough. The networks was unpredictable: it most cases, pages and content loaded, but sometimes you had to reload hanging pages. Probably same issues made the violation arrive later than the timeout (left). In other cases there were simply large delays (right). However, I could not reproduce this phenomena in the office by simulating heavy traffic, e.g., opening a lot of tabs in parallel or downloading stuff.